Pelu Awofeso is a travel writer, journalist and publishing entrepreneur based in Lagos, Nigeria. 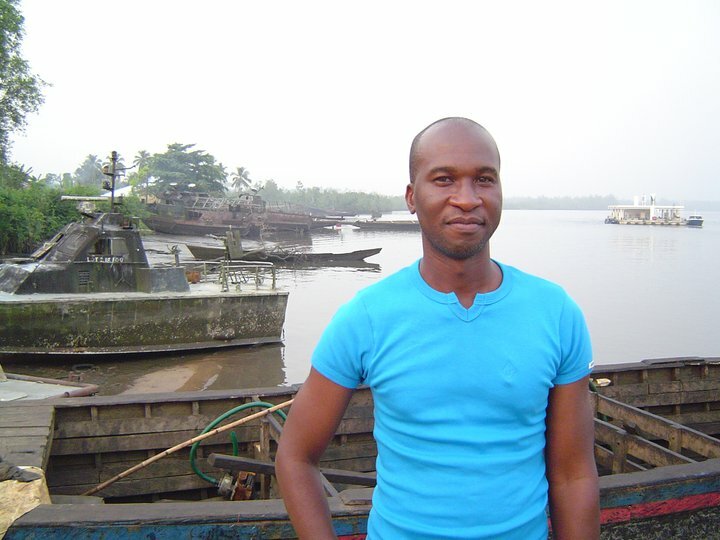 For over ten years Pelu has been travelling across Nigeria and publishing travel writing in newspapers in Nigeria and beyond, and in his own travel books. 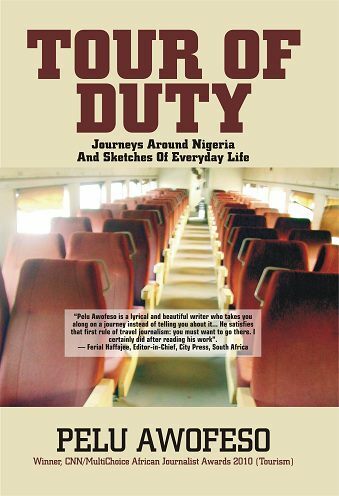 His most recent book is Tour of Duty (2010), which documents ten months travelling the width and breadth of Nigeria, and tells the stories of people and places he encounters on the way, from the sand sellers of Yenagoa to hunters in Osogbo. When he’s not on the road, one of Pelu’s many other projects is publishing his print and online travel magazine Waka-About through his publishing outlet Homestead Enterprises, as well as a forthcoming series of mini-guidebooks to Nigeria and an anthology of international travel writing by Nigerians. In 2010 he won the tourism category of the CNN Multichoice African Journalist Award for his travel writing. He has also worked as a tourism development officer and a journalist. Rebecca Jones met Pelu in Ibadan to talk to him about his work as a traveller, writer and publisher. So, why travelling, and why travel writing? Everything began in 1998, when I went to serve National Youth Service. I was posted to Jos, capital of Plateau state. While I was in Jos, I went into the library, and I came across writing from the past by the British. I saw images from 1930s, 1940s, 1950s; they were so strong I felt like I was seeing that time. After they left I don’t think many people were doing that any more. Those encounters seeded me to want to follow in their footsteps, to travel extensively in Nigeria and document what I’ve seen. It made me develop more interest in Jos and also in travelling, to also write about this beautiful place people have written about 50 years ago. I wanted to write something that could actually benefit society. And I had to think about writing about Nigeria in such a way that people appreciate the country. Not just the foreign audience, but also Nigerians. In 2002, I was working for Africa Today as a travelling arts correspondent. At the time I was so very interested in festivals. And I saw so many foreign visitors there, in their hundreds. And they were not just sitting down, they were having fun, they were always enjoying the sights, taking pictures. And I was like: those guys are enjoying Nigeria, for God’s sake! When elsewhere we hear so many people saying bad things about Nigeria, these guys are saying something different. 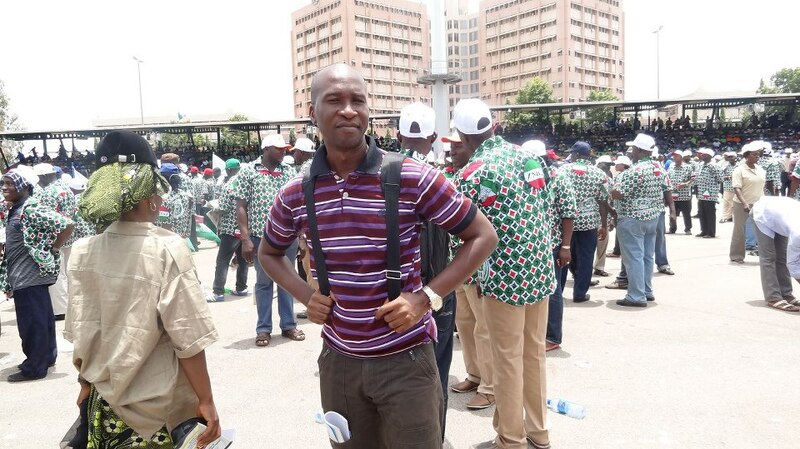 I was angry with the Western media’s depiction of Nigeria as a no-go area for foreign visitors. I thought I would use these sorts of experiences to tell people that look, you can have fun in Nigeria. Forget everything else you hear. Nobody is saying that Nigerians don’t have stress. But there was actually a time that I purposely was taking pictures of a large crowd of foreigners. I was so bent on capturing some of these images and then releasing them with a good narrative, so that when people see them it gives them a good, different view of Nigeria. I did that for so many years. And then I felt, OK, no, I don’t want to do please anybody any more. I don’t want to please any white man or woman. I will just write what I want to write. If a visitor comes across it, fine. If a Nigerian or African comes across it, fine. But I won’t be writing mainly to appease the foreign visitor. I will do my travel writing in the best way possible, following global standards, and put it in the public space. But I do also know I am writing for the foreign market, I am writing for people who are coming into this country who need access to that information. I also write so that Nigerians can appreciate their own country. Because we talk down on Nigeria a lot. And that is because we are very angry with the government. So many people are pissed off. I’m also going through all of that stress, but we can’t all continue to write negatively about Nigeria. Somebody must view the other one, and write beautiful stories about the country. Domestic tourism isn’t encouraging at the moment, and part of what I hope to achieve in my lifetime is to inspire thousands of Nigerians to appreciate the travel assets scattered around the country. People generally complain about the derelict infrastructure (especially the roads) and the non-attractivenes of the tourist sites. But Nigerians love to relax and catch fun–they just never do these farther from home. Tell me about your experience of publishing. I wonder if you have the same experience as other writers – novelists, poets – in Nigeria? I think we basically have the same story to tell. It’s tough publishing in Nigeria. Even up until the 80s, Nigeria had a very flourishing literary society. But when the structural adjustment policy devalued the currency, the only thing that was profitable was the publishing of educational books. Not reading for leisure; you couldn’t find novels any more to read. And so, people growing up during that time couldn’t find indigenous literature to read, stories written for Nigerians, so they turned to the Mills and Boon, James Hadley Chase, James Bond and crime writers from all over the world. And then the publishing industry died the more. Now, there are independent printing and publishing houses who are trying to revive it, but it’s still difficult getting people to read those books; it’s still difficult getting the funding to publish the books. I realised that there is no publishing house that’s interested in travel journalism or travel books. So right from the beginning I knew I was going to be publishing for myself. Many people have their impressions about vanity publishing or self-publishing; in Nigeria people don’t care, because that’s the only way they can get their books out, not because they honestly want to do it but because there is no alternative. It’s tough-going. You have to save and save to be able to publish just a thousand copies. Many people cannot go beyond a thousand or two thousand copies. You can’t really do mass production; you don’t have the facilities for that, and you don’t have the market. In the past, the print quality was so bad, and that further made people lose interest in reading. Over time, people have realised that packaging is something for the book to sell, so we’re beginning to see the publication of some very nice books, and gradually people are buying books. My travel books have also sold quite well, and I’m happy about that. I’m just hoping that with my success, many more people will be inspired to also do the same thing. We need a dozen people, maybe a hundred people, travelling all over Nigeria, writing for very glossy travel magazines or newspapers. When you are travelling, do you meet other travellers and share experiences? I think I’m the only person who is travelling actively on a tourism-based project trying to document my people and to write about the society. Nigeria is my playground, I’m the only one just playing all over Nigeria. People are not playing with me; they are not enjoying the country with me. I wish more people would just pack their bags and go. travel writing as popularised by Western writers, but in Nigeria, I am all by myself. I have met just one or two people who have done their own stuff. There are two sisters, Chioma and Oluchi Ogwuegbu, whose tour was called ‘Celebrate Africa’. I met them about the time I launched my own Tour of Duty project. I was so amazed – so, I am not the only person who can actually travel! They went across West Africa. From day one, it has always been Nigeria I really want to change for the better, and then we can stretch our interests to the other parts of Africa. But I feel really inspired by their trips, and the fact that two young people will leave their family, and just go across the continent. There’s also a group of photographers, ‘Invisible Borders’, who travel across West Africa by road. 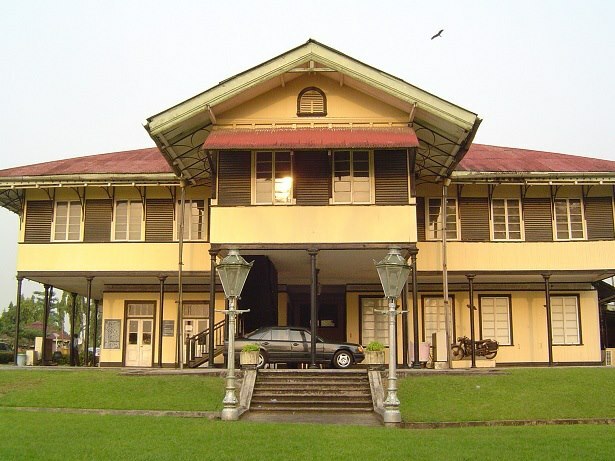 Do you consider your work to be helping to maintain Nigerian cultural heritage? I believe so. 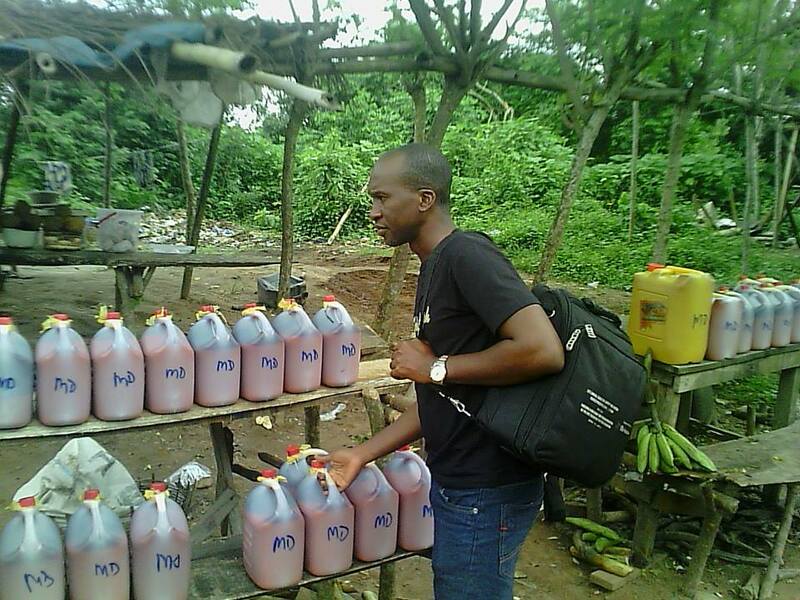 I documented a palm wine tapper. That’s part of our heritage. I asked one of them, are any of your children following in your footsteps? He said no. So, in the course of time, that man is going to die, and nobody is going to take over. In Ogun State, I went to where they do tie-and-dye batik, I also documented that. I documented festivals. So if anybody comes across my work they will see that this thing used to happen, and somebody was able to put it down from real life encounters. But the sad thing is that Nigerian writers are not so keen on non-fiction, documenting everyday life. The journalists are only about news gathering and news reporting. An average Nigerian journalist will not go out of his way to do a feature on something so significant that needs to be preserved for posterity. They just go to where the story is – they even clean the interviews, record something new over it. They don’t think the things they are recording are actually documents worth preserving. I came into writing and to journalism knowing I wasn’t just going to be writing for today; I wanted to be writing for tomorrow. I want to now go from travel writing to becoming a political activist, because I’m really very angry now. There are some fiction writers who are trying to create a narrative of everyday Nigeria, or middle-class Nigeria, to counteract pervasive depictions of poverty, war and so on. Do you consider your work to be doing something similar? I’m just trying to portray my country in the light I feel it should be seen. Some time ago, I came across a Nigerian journalist who works for the BBC. And he said, “Pelu, well done on what you are doing. But you say you always want to write something positive about Nigeria. It doesn’t have to be like that. Journalism is also about telling the truth. You can’t close your eyes to all the rubbish you see on the road. You owe your readers the truth as well.” This all happened in a particular location in Nasarawa state, and they live in abject poverty. They didn’t have borehole water, they didn’t have light. And I thought he was making a point. But if wanted to do that I would do a news story on that, it wouldn’t be a travel article. I would do a feature article and say this is the plight of those people. Somebody must take up that battle to write about it. I’m doing something unique, so I won’t divide myself into two. What is the importance of audience response to your work, and who are your readers? Now, I have more readers than I used to. When I was starting out, I knew I wanted to convince people with my writing so that they could travel in Nigeria. So I needed to know how that was working out in the real world, whether people were really reading me, and actually being influenced by my writing to travel. I worked for Africa Today for three years, publishing travel stories. But I never once read a letters page where someone referred to an article I wrote. They always replied to the political stories. But as time went on, I got feedback when people began to see stories online, where you can actually publish your comments. And it really encourages me to go ahead and do more writing. Any writer who hasn’t caught the online bug needs to do so fast – that appears to be the future of writing and publishing. A writer needs a huge readership to make the necessary impact on society; the internet provides that better than print publications. The most amazing feedback I got was from a woman who had stumbled on my Facebook wall. She went to my photos and that helped her to see Nigeria in a different light. She is a Nigerian, and she is going to be using my images to teach her children about Nigeria, because they are in the States, and she hasn’t been home a long while, and her children have never stepped foot on Nigerian soil. This was the most uplifting commentary I have received. How do you see travel writing developing, both in Nigeria and more generally? Travel writing has developed so well in the West, where the culture of travelling is second nature. The trend is already catching on in Africa. The only thing lacking is the number of real travel writers to lure more people to take a leisure trip. We will get there sooner rather than later, I believe. Many thanks to Pelu Awofeso being so generous with his time for this interview (of which this is just an excerpt). As well as his website and blog, you can follow Pelu on Twitter and Facebook for regular dispatches from the road, updates on his work, and many more photos of his travels and of everyday life in Nigeria. Thank you Rebecca and Pelu Awofeso for the really good interview! I think the work of showing other sides of Nigeria are as important (or even more) as the journalistic approach of “denouncing the reality”. Of course journalism has its role in bringing to the fore social injustices that need to be addressed. But a the same time, it also forms opinions that can be quite damaging for the same people they are trying to help – being from Rio de Janeiro makes me experience some of that too. The complexity of a country like Nigeria and the many sides and facets it has will never be totally covered in any narrative. And this is not the aim of any writer, I think. The beautiful work of Pelu Awofesu only adds to this complexity. He does not seem to be avoiding reality, but avoiding a flattened speech delimited by stereotypes. Thanks Nara, and I think ‘avoiding a flattened speech delimited by stereotypes’ is a really good way to put it. And an interesting comparison to Rio de Janeiro; are there similar debates going on there about ‘positive’ and ‘negative’ representations in writing/journalism? Thank you Rebecca and Pelu, for sharing your idea about travelling and travel writing through interview . As i think it is the only way you can have fun and the same time you can also be informative towards society. Using this platform of writing we can make people aware of beautiful world around us. We should promote this art through travel guide and travel writing as their are very less number of people who chose this profession.